Based on the fact that the majority of big money trades fundamentally, we should expect the overall trend of the euro to rally against the pound. 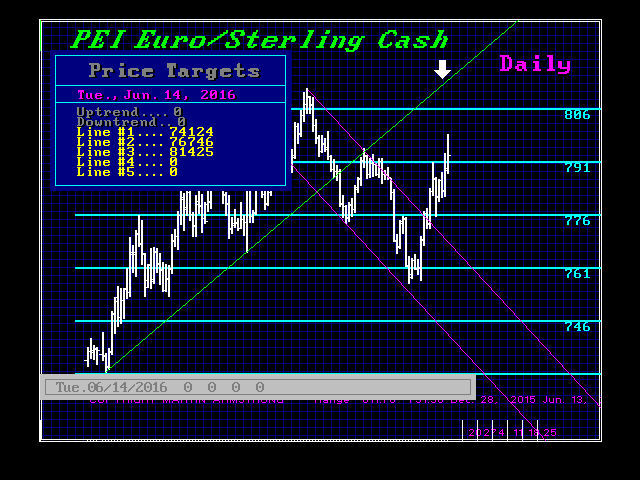 We can see that the euro has been strong, rising sharply, and we may yet see a further rally. Keep in mind that the LONG-TERM projections are bearish for the euro against the pound and the dollar. Nonetheless, with the BREXIT vote, the bulk of major money will be caught on the wrong side. So they should believe the propaganda and then we should see the trend flip. This means the euro should first rally and then trap the majority before turning back down. Here is the Daily Array as we approach BREXIT.